Between the time Wong Kar Wei announced plans for making a biopic about Bruce Lee’s martial-arts master, Yip Man, and the time The Grandmaster actually hit theaters, at least three other films about him made it to movie screens. And even if Wong seems to be approaching Stanley Kubrick in terms of meticulousness and output — The Grandmaster’s shooting schedule alone consumed three years, the editing a full year — in this case (unlike as with Wong’s 2046), the results are worth the wait. The Grandmaster finds Wong returning to his familiar theme of the elusiveness of happiness, only this time in the context of an epic of mid-20th-century Chinese history. It’s like a combination of Sergio Leone’s Once Upon a Time in America (that film’s Ennio Morricone soundtrack is sampled extensively) and Wong’s previous In the Mood for Love, only with lots of exquisitely staged martial-arts encounters. So what’s not to like? The story concerns the unification of the Northern and Southern Chinese schools of martial arts. The modest Southern school champion, Yip (Tony Leung) defeats the respected, retiring and previously undefeated Northern grandmaster (Wang Qinchiang), in a match in which no blows are exchanged, only to lose to his daughter (Ziyi Zhang), in a contest that is as much courting ritual as combat. They plan a rematch, but then World War II happens, and plans are shattered, lives ruined, and several characters die. The bittersweet final third of the film finds the surviving characters, who have all fled to the relative safety of Hong Kong, coming to grips with their diminished circumstances, with only Yip seeming to achieve some measure of solace by assuming the role of a living repository of Chinese martial-arts (and by extension, Chinese culture). Unlike most martial-arts movies, there’s no movie-ending cathartic defeat of the main bad guy (that occurs about a half-hour before the movie ends and doesn’t even involve Yip), but it’s not like Wong has followed traditional plot structures in his previous films, either. But Wong retains his ability to infuse the most mundane of images — a coat button, the striking of a match, the turn of a hand in martial-arts fight — with resounding meaning. 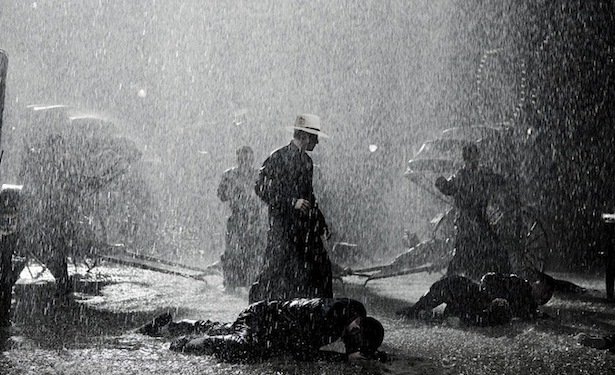 And although Wong no longer works with cinematographer Chris Doyle, he seems to have found a suitable replacement in Philippe Le Sourd, as The Grandmaster is the most beautiful-looking film since the last Wong-Doyle collaboration, In the Mood for Love, with a nighttime martial-arts duel on a snowy train platform being the high point. At his best, Wong is pretty much without peer among active film directors, and with The Grandmaster, Wong is again at his best. More to the point, it’s a film that needs to be seen on a big screen to fully appreciate its beauty. And you don’t even have to wear 3-D specs to do so.